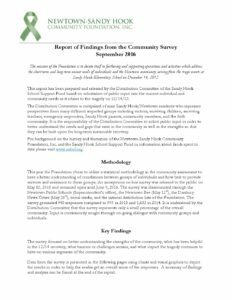 Recently we in the community are very excited to read the report (PDF) from the work done around the Newtown, CT tragedy. It is very comforting and rewarding to learn that by far the most effective therapy for clients was Brainspotting™. As Brainspotting clinicians, we believe in its quiet power to create healing as we witness clients move through traumas and pains in new ways, day after day. It is all the more rewading to learn that those receiving the therapy are seeing and feeling the same things. This article (PDF | DOI link) in the professional journal Medical Hypotheses is a clinical review of Brainspotting as a therapy for posttraumatic disorders. Its authors are Brainspotting founder David Grand and Dr. Frank Corrigan. Brainspotting is a psychotherapy based in the observation that the body activation experienced when describing a traumatic event has a resonating spot in the visual field. Holding the attention on that Brainspot allows processing of the traumatic event to flow until the body activation has cleared. This is facilitated by a therapist focused on the client and monitoring with attunement. We set out testable hypotheses for this clinical innovation in the treatment of the residues of traumatic experiences. The primary hypothesis is that focusing on the Brainspot engages a retinocollicular pathway to the medial pulvinar, the anterior and posterior cingulate cortices, and the intraparietal sulcus, which has connectivity with the insula. While the linkage of memory, emotion, and body sensation may require the parietal and frontal interconnections – and resolution in the prefrontal cortex – we suggest that the capacity for healing of the altered feeling about the self is occurring in the midbrain at the level of the superior colliculi and the periaqueductal gray. This article (PDF | DOI link) is written by Anja Hildebrand, David Grand, and Mark Stemmler. It was published in the Mediterranean Journal of Clinical Psychology. Objective: This study aims at determining the efficacy of the new therapy approach Brainspotting (BSP) in comparison to the established Eye Movement Desensitization and Reprocessing (EMDR) approach for the treatment of Posttraumatic Stress Disorder (PTSD). Method: The sample consisted of 76 adults seeking professional help after they have been affected by a traumatic event. Clients were either treated with three 60-minute sessions of EMDR (n=23) or BSP (n=53) according to a standard protocol. Primary outcomes assessed were self-reports of the severity of PTSD symptoms. Secondary outcomes included self- reported symptoms of depression and anxiety. Assessments were conducted at pretreatment, posttreatment and 6 month after the treatment. Results: Participants in both conditions showed significant reductions in PTSD symptoms. Effect sizes (Cohen’s d) from baseline to posttreatment concerning PTSD related symptoms were between 1.19 – 1.76 for clients treated with EMDR and 0.74 – 1.04 for clients treated with BSP. Conclusion: Our results indicate that Brainspotting seems to be an effective alternative therapeutic approach for clients who experienced a traumatic event and/or with PTSD. 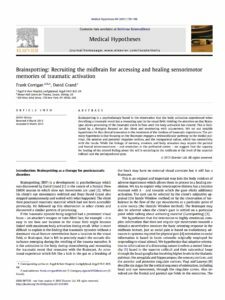 This article (PDF | DOI link) in the professional journal Medical Hypotheses. Its authors are Brainspotting founder David Grand, Dr. Frank Corrigan, and Dr. Rajiv Raju. 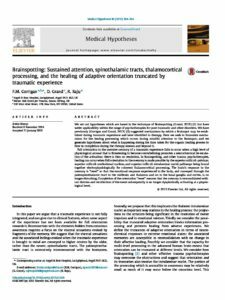 We set out hypotheses which are based in the technique of Brainspotting (Grand, 2013) but have wider applicability within the range of psychotherapies for post-traumatic and other disorders. We have previously (Corrigan and Grand, 2013) suggested mechanisms by which a Brainspot may be established during traumatic experience and later identified in therapy. Here we seek to formulate mechanisms for the healing processing which occurs during mindful attention to the Brainspot; and we generate hypotheses about what is happening during the time taken for the organic healing process to flow to completion during the therapy session and beyond it. Full orientation to the aversive memory of a traumatic experience fails to occur when a high level of physiological arousal that is threatening to become overwhelming promotes a neurochemical de-escalation of the activation: there is then no resolution. In Brainspotting, and other trauma psychotherapies, healing can occur when full orientation to the memory is made possible by the superior colliculi-pulvinar, superior colliculi-mediodorsal nucleus, and superior colliculi-intralaminar nuclei pathways being bound together electrophysiologically for coherent thalamocortical processing. The brain’s response to the memory is ‘‘reset’’ so that the emotional response experienced in the body, and conveyed through the paleospinothalamic tract to the midbrain and thalamus and on to the basal ganglia and cortex, is no longer disturbing. Completion of the orientation ‘‘reset’’ ensures that the memory is reconsolidated without distress and recollection of the event subsequently is no longer dysphorically activating at a physiological level.